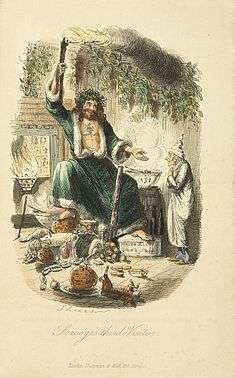 Illustration by James McBryde for M.R. James's story "Oh, Whistle, And I'll Come To You, My Lad". A ghost story may be any piece of fiction, or drama, that includes a ghost, or simply takes as a premise the possibility of ghosts or characters' belief in them. The "ghost" may appear of its own accord or be summoned by magic. Linked to the ghost is the idea of "hauntings", where a supernatural entity is tied to a place, object or person. 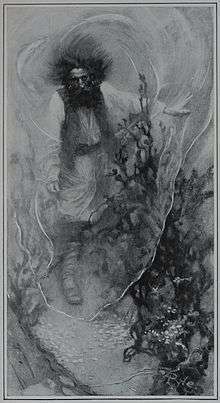 The One Thousand and One Nights, sometimes known as Arabian Nights, contains a number of ghost stories, often involving jinn, ghouls and corpses. In particular, the tale of "Ali the Cairene and the Haunted House in Baghdad" revolves around a house haunted by jinns. Other medieval Arabic literature, such as the Encyclopedia of the Brethren of Purity, also contain ghost stories. "Hamlet and his father's ghost" by Henry Fuseli (1780s drawing). The ghost is wearing stylized plate armor in 17th-century style, including a morion type helmet and tassets. Depicting ghosts as wearing armor, to suggest a sense of antiquity, was common in Elizabethan theater. "Golden Age of the Ghost Story"
Irish author Sheridan Le Fanu was of the most influential writers of ghost stories.. 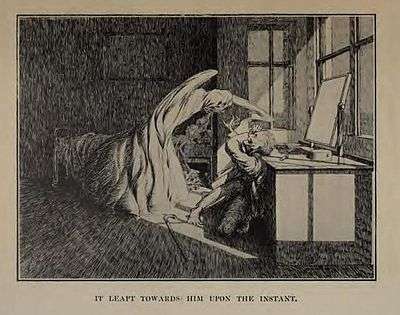 Le Fanu's collections, such as In a Glass Darkly (1872) and The Purcell Papers (1880), helped popularise the short story as a medium for ghost fiction. Charlotte Riddell, who wrote fiction as Mrs. J. H. Riddell, created ghost stories which were noted for adept use of the haunted house theme. 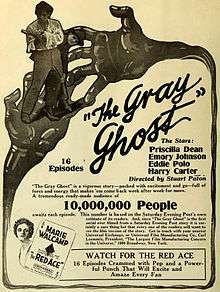 In fictional television programming, ghosts have been explored in series such as Ghost Whisperer, Medium, Supernatural, the television series adaptation of The Ghost and Mrs. Muir and Randall and Hopkirk (Deceased). In animated fictional television programming, ghosts have served as the central element in series such as Casper the Friendly Ghost, Danny Phantom, and Scooby-Doo, as well as minor roles in various other television shows. 1 2 3 4 5 6 7 8 9 10 Darrell Schweitzer (2005). The Greenwood Encyclopedia of Science Fiction and Fantasy: Themes, Works, and Wonders. Westport, CT: Greenwood. pp. 338–340. 1 2 "Ghost Stories" in Margaret Drabble (ed. ), The Oxford Companion to English Literature. Oxford, Oxford University Press, 2006. ISBN 9780198614531 (p. 404-5). ↑ J. Gordon Melton. Encyclopedia of Occultism & Parapsychology. Gale Group. ISBN 0-8103-5487-X. ↑ Vassler, Bill. "Campfire Stories: The Art Of The Tale". Westside Toastmasters. Retrieved 12 August 2014. ↑ Gordon, Lauren (16 July 2014). "9 Scary Campfire Stories That'll Make You Drop Your S'mores". ABC News. Retrieved 12 August 2014. ↑ Carey, Joanna (17 February 2004). "Ghouls for schools". The Guardian. Guardian News and Media. Retrieved 13 August 2014. 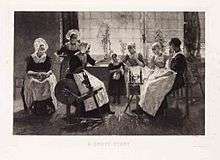 1 2 Carpenter, Lynette; Kolmar, Wendy K. Ghost Stories by British and American Women: A Selected, Annotated Bibliography. Taylor & Francis. pp. xxii. ↑ Finucane, R. C. (1984). Appearances of the Dead: A Cultural History of Ghosts. Prometheus Books. pp. 4, 16. ISBN 0879752386. ↑ D. Felton (2010). Haunted Greece and Rome: Ghost Stories from Classical Antiquity. University of Texas Press. pp. 50–51. ISBN 0-292-78924-6. ↑ Jaehnig, K.C. (1999-03-11). "Classical ghost stories". Southern Illinois University. Archived from the original on September 8, 2007. Retrieved 2007-09-19. ↑ Braund, Susanna (28 March 2013). Buckley, Emma; Dinter, Martin T., eds. "Haunted by Horror: The Ghost of Seneca in Renaissance Drama". A Companion to the Neronian Age. Oxford: Wiley-Blackwell. doi:10.1002/9781118316771.ch24. Retrieved 17 August 2014. 1 2 Yuriko Yamanaka, Tetsuo Nishio (2006). The Arabian Nights and Orientalism: Perspectives from East & West. I.B. Tauris. pp. 83–84. ISBN 1-85043-768-8. ↑ Hamori, Andras (1971). An Allegory from the Arabian Nights: The City of Brass. Bulletin of the School of Oriental and African Studies. 34. Cambridge University Press. pp. 9–19 . doi:10.1017/S0041977X00141540. ↑ Ian Richard Netton (1991). From the introduction of Muslim Neoplatonists: An Introduction to the Thought of the Brethren of Purity. Edinburgh University Press. p. 59. ISBN 0-7486-0251-8. ↑ Smith, Tom (August 6, 2014). "Hyper Japan hails digital-age 'Genji' opera". The Japan Times. Retrieved August 12, 2014. ↑ Graves, Zachary (2011). Ghosts the complete guide to the supernatural. Eastbourne, UK: Canary Press. p. 182. ISBN 9781908698124. 1 2 Jones, Ann Rosalind; Stallybrass, Peter (2000). Renaissance Clothing and the Materials of Memory. Cambridge University Press. p. 248. ISBN 0521786630. Retrieved August 16, 2014. ↑ Helen Child Sargent; George Lyman Kittredge (1904). English and Scottish Popular Ballads edited from the Collection by Francis James Child. New York: Houghton Mifflin. 1 2 3 4 Newman, Kim (ed.) (1996). BFI Companion to Horror. London: Cassell. p. 135. ISBN 030433216X. ↑ Pamela Davidson. Russian Literature and Its Demons. Berghahn Books, 2000. ISBN 9781571817587. Page 59. 1 2 3 4 5 Jack Sullivan (1986). 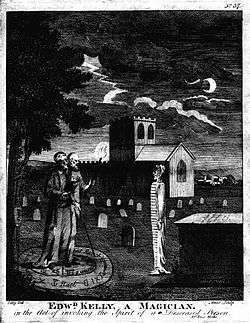 "Golden Age of the Ghost Story" in The Penguin Encyclopedia of Horror and the Supernatural. Viking Press. pp. 174–6. ISBN 0-670-80902-0. ↑ J. L. Campbell, Sr., "Mrs. J. H. Riddell", in Bleiler, ed., Supernatural Fiction Writers. ↑ James, M. R. (December 1929). Some Remarks on Ghost Stories. The Bookman. pp. 55–56. ↑ Barger, Andrew (2015). Middle Unearthed: The Best Fantasy Short Stories 1800-1849. Bottletree Books LLC. p. 13. ISBN 978-1-933747-53-8. 1 2 James, M.R., "Preface to More Ghost Stories of an Antiquary". In Joshi, S.T., ed. (2005). Count Magnus and Other Ghost Stories: The Complete Ghost Stories of M.R. James, Volume 1, pt. 217. Penguin Books. ↑ Sleepy Hollow at Box Office Mojo. Retrieved 29 January 2009. ↑ Cameron, George Frederick (1889). Leo, the Royal cadet. 1 2 3 Foutz, Scott. 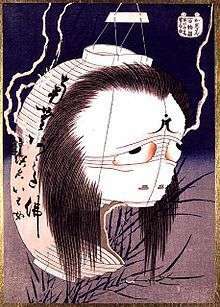 "Kaidan: Traditional Japanese Ghost Tales and Japanese Horror Film". Retrieved 14 August 2014. 1 2 "What are Kaidan". Hyakumonogatari Kaidankai. Retrieved 14 August 2014. ↑ "Kwaidan", by Brian Stableford, in Frank N. Magill, ed., Survey of Modern Fantasy Literature, Vol 2. Englewood Cliffs, NJ: Salem Press, Inc., 1983, ISBN 0-89356-450-8 (pp. 859-860). ↑ Landon, Brooks (1983). "The Short fiction of Leiber". In Magill, Frank N. Survey of Modern Fantasy Literature, Vol 4. Englewood Cliffs, NJ: Salem Press, Inc. pp. 1611–1615. ISBN 0-89356-450-8. ↑ Sullivan, Jack. "Shirley Jackson". In Bleiler. Supernatural Fiction Writers. pp. 1031–1036. ↑ Joshi, S. T. (2001). Ramsey Campbell and Modern Horror Fiction. Liverpool: Liverpool University Press. pp. 53–63. ISBN 0-85323-765-4. ↑ Babbis, Maurice. "The True Origin of the Horror Film". Emerson.edu. Emerson College. Retrieved 11 August 2014. ↑ "Blithe Spirit". British film institute. Retrieved 11 August 2014. ↑ Chanko, Kenneth M. (August 8, 1993). "FILM; When It Comes to the Hereafter, Romance and Sentiment Rule". The New York Times. Retrieved 2009-01-29. ↑ Rafferty, Terence (June 8, 2003). "Why Asian Ghost Stories Are the Best". The New York Times. Retrieved 2009-01-29. ↑ Mohamed, Shoaib (September 24, 2007). "The Bus Conductor Turned Superstar Who Took the Right Bus to Demi". Behindwoods. Retrieved 2010-03-17. ↑ "Anjaane – The Unknown". Indiafm.com. December 30, 2005. Retrieved 2010-03-17. ↑ Williams, Karen (2010). "The Liveness of Ghosts: Haunting and Reality TV". In Blanco, María del Pilar; Peeren, Esther. Popular ghosts : the haunted spaces of everyday culture. New York: Continuum. pp. 149–160. ISBN 9781441163691. ↑ "Hello darkness, my old friend...". Indian Express. Indian Express Newspapers (Bombay) Ltd. 3 November 1997. Retrieved 17 March 2010. Felton, D. (1999). Haunted Greece and Rome: Ghost Stories from Classical Antiquity. University of Texas Press. ISBN 0-292-72508-6.